This book provides an introduction to understanding combustion, the burning of a substance that produces heat and often light, in microgravity environments-i.e., environments with very low gravity such as outer space. Readers are presented with a compilation of worldwide findings from fifteen years of research and experimental tests in various low-gravity environments, including drop towers, aircraft, and space. 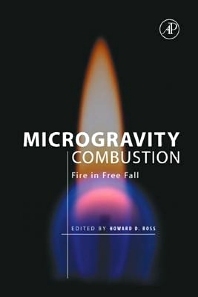 Microgravity Combustion is unique in that no other book reviews low- gravity combustion research in such a comprehensive manner. It provides an excellent introduction for those researching in the fields of combustion, aerospace, and fluid and thermal sciences. Mechanical, chemical, and aerospace engineering professionals, researchers, and students. Howard D. Ross is the Senior Researcher in microgravity science at NASA Glenn Research Center. He has participated in combustion experiments performed in the Space Shuttle, Mir, drop towers, aircraft, and sounding rockets. He has over 100 publications and presentations in this field, and advises NASA on spacecraft fire safety.